Enhance liturgies with simple singable ballads that alternate with sophisticated choral anthems, gospel-style songs and grand hymns for full-choir. In Faith, in Hope is a box of musical jewels that can adorn the liturgy on a variety of occasions throughout the year. Spirited, beautifully crafted and easy to introduce, these 14 versatile songs will quickly become a familiar—and beloved—part of your community’s repertoire. Christopher once again proves his extraordinary ability to compose in a variety of styles, his English roots and musical training adding their usual richness and color to the harmonic structure and melodies. Simple singable ballads alternate with sophisticated choral anthems, gospel-style songs and grand hymns for full-choir. Arranged with parts for the assembly and harmony and descants for choir, most songs also offer optional parts for other instruments, including strings and harp. There’s something for everyone! The collection includes two songs suitable for the dedication or anniversary of a parish or cathedral: “Sumus Domus Domini” (“We are the household of the Lord”), which was commissioned for the dedication of Our Lady of the Angels Cathedral in Los Angeles in 2002, and “Great Is the Power,” both arranged for full choir, organ and brass. 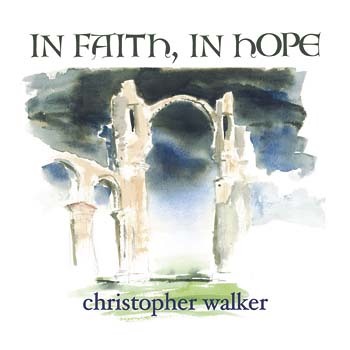 Offering music for weddings, funerals and every season of the liturgical year, In Faith, in Hope is a highly polished, multi-faceted gem of a collection—just what we would expect from this master craftsman.